Are you seeing many spring flowers at your house? The twins and Pierce love to go on walks and look for flowers. They are so sweet as they often bring me dandelions. I decided to do a spring flower theme for Muffin Tin Monday for the boys. The blue tins are roses, and the pink tin (Pierce's) has assorted flower shapes. 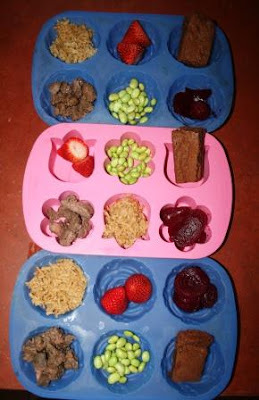 The boys had some Asian style grass fed beef, beef seasoned rice, edamame, strawberries, the last of our pickled beets that I canned last summer, and a coconut brownie. The coconut brownie is a recipe I created to use coconut oil, and you can find the recipe here. They're pretty tasty! For more fun ideas of cooking with kids, check out Muffin Tin Mom. Everything looks so fun and tasty! I would love this for lunch or dinner! Yum! You all are ready for spring! Happy MTM, Lisa! Love the flowers. :) Hope you're all doing well! A+ for that spring design Lisa. Nicely done. Such a balanced meal, and pretty to look at too! what a cute idea. I bet they loved that. Well, we were seeing flowers...until this last bit of cold hit. Now just snow and wind...Your muffin tins are adorable. I hope that the weather is not too cold there and your other flowers continue to bloom! These lunches do look yummy! I can't wait for our strawberries to be ready-I think like tomatoes, home grown strawberries are so flavorful! I will definitely check out those brownies too! So pretty, and healthy. They are finding out that coconut oil works wonders for Alzheimer's. You always come up with cute, tasty lunches for them! Sounds great and I love your flower tins. Last week we were enjoying the flowers, this week, not so much. At least today. I look out my window and see a few inches of snow plus more coming down. What a great idea...my son never liked any of his food touching on his plate (and still doesn't) so he wouldhave loved that idea! I've got some daisies my son picked me the other day in the window in a vase! lol Us mommas love our boys! It looks AND sounds good. Love those pickled beets! We've been finding flowers everywhere lately! We've been picking them by handfuls, and weaving dandelion chains at the park, etc., so this lunch seems perfect. Muffin Tin Mondays are always fun! What a fun way to have a meal!!! Those coconut brownies sound sooo yummmy! I love the spring flower theme, very cute. Our spring flowers have had a really hard time this year, it would get warm and then cold. A lot of my flowers froze right after blooming for a day. YOur flower tins are so cute! Those brownies look delicious!